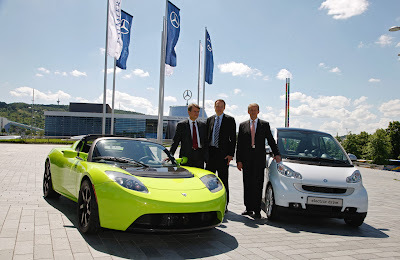 On May 19 at 655am Daimler and Tesla hosted a joint press conference announcing Daimler's investment of $55MM for 9%+ of Tesla Motors plus options to buy more in the future. Both (unofficially) get access to the US DOE loan of $350MM for Advanced Vehicle Manufacturing....not official yet. I am happy for Tesla, but skeptical of such a deal for a couple of key reasons. 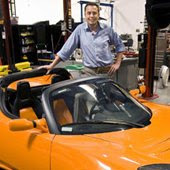 Given Tesla's ambitions and business plan to develop "super efficient electric vehicles" (from the website), it seems that this money is enough to develop their next Model S, but not enough to develop a Company in the way they have panned to build it. Similarly, for Daimler, this is a cash outlay, in a time much desirous of precious cash, into a Company whose only significant asset is their electric system (motor and controller and pack), which arguably could be obsoleted by ten Companies already out there in the market. I believe that there is more money for Tesla to need to raise in the future, and more investments for Daimler to need to make. For both, this deal really seems to buy time and excitement, but not a strategic end in and of itself. At least both agreed that lightweighting is a critical path to be taken in the future. I do not mean to sound negative, as this is a major valuation landmark in the auto market and Tesla has once again led the way. I am compelled, however, to share the overall summary of the deal as I see it. As always, I am happy for questions and thoughts. And PLEASE give all of us your thoughts in this poll. The Obama Administration expects to take General Motors into Chapter 11 bankruptcy Monday and quickly get the carmaker out with $30.1 billion in bankruptcy financing, the White House said in a statement tonight [Sunday Night]. 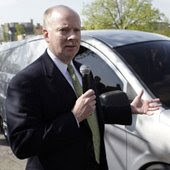 The federal government will have the right to replace GM's current board of directors with its own trustees, except for one director who will be picked by the Canadian government and another selected by a UAW-administered retiree health care trust. But the White House vowed to exercise its ownership stake in GM "in a hands-off, commercial manner." That is, to let it operate as a car company, not a government agency. The Obama administration said it didn't intend to provide funding beyond the $30.1 billion in bankruptcy financing. 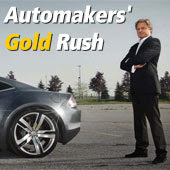 The government has already assisted GM with $19.4 billion since late December. The $30 billion will give the government a 60 percent stake in a reorganized GM. The governments of Ontario and Canada will provide another $9.5 billion in financing to GM for a 12 percent stake in the new GM. 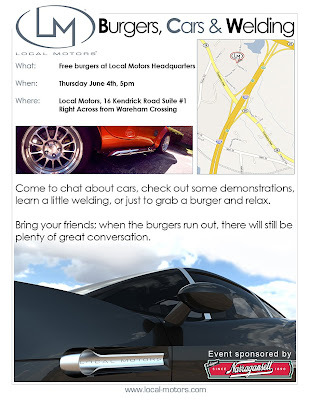 Next week will be the beginning of what we believe will be a new tradition in the Southcoast, Local Motors' Burgers, Cars, and Welding (BCW). Sponsored in part by Narragansett Beer, another local hero, this will be an unforgettable eent. Please join us if you are anywhere in the area. 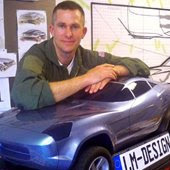 Tonight voting will end in the first ever Custom Car Skins Competition at Local Motors. For the LM community this was a first and the entrants did an exceptional job. Working with a mood board set out by a client (me, in this case), the designers delivered their vision for this skin. Again, though the CCS product will be offered only on LM vehicles for the foreseeable future we decided to start with a classic 280SL as a showcase to start the process. 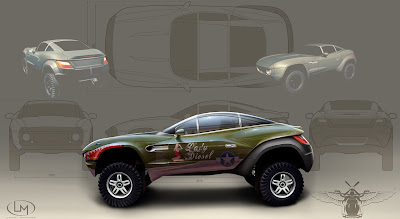 Today the window to submit designs for Local Motors new Custom Car Skins ® Competition began. Come check out the brief! 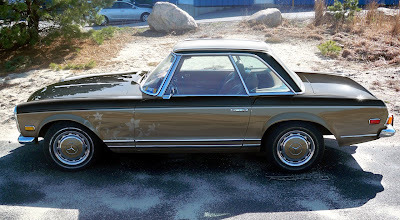 Maybe you too will submit an idea for this classic 280SL. Made of stamped steel, and usually crafted by prison inmates, the plate is a fixture and a relatively unremarkable thing despite the various colors and images that have emerged over the years. 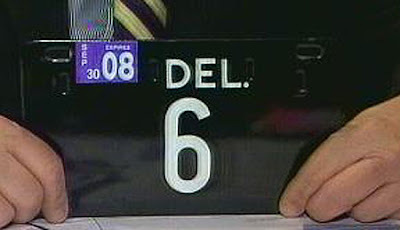 And then there is Delaware. 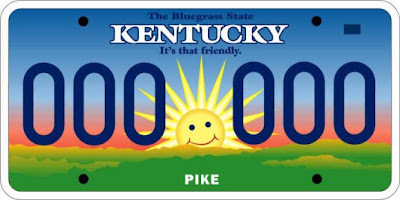 For this small state, there is an historic type of plate that is still issued if you are so inclined, and that is the state's 5.25"x9.5" ceramic or porcelain tag. Just a couple of days ago I saw one out on the MA roads and I thought I would note it in the Vision Blog. Such vignettes of regulatory difference are often the stuff of automotive legend. I wonder who will be the first Delaware resident to put one of these shiny black plates on a Local Motors vehicle? Over the weekend an intense debate reigned in the community about the way in which we vote for Competition entries. Many questions were asked and many answers given but the bottom line seems to be that a vocal group of community members feels that the voting system for Local Motors Competitions is inadequate to express all of the feelings of the community. The Scale is a single rating from 0-5 that begins the day that a submission is made and ends the day in which voting is declared over. The scale is meant to be a combined judgement of all that a voter feels about a project. A separate button is provided to answer simply whether you would want to own the vehicle regardless of your vote. The end day of voting is usually a week or so after the submission deadline so that all designs whether entered upon opening of submission acceptance or right at the end of the submission window receive a time of scrutiny side-by-side. Furthermore, our policy is not to display voting until the winner has been selected. This choice is to avoid attack on the site during the voting window by those who might feel the votes are "breaking unfairly" and to allow all who come, to vote unbiased by the early returns. Members of the community have pointed out that the scale is not adequate to distinguish between those which are beautiful renderings and designs which meet the specifications in the brief. The basic complaint is that some winners may have the best looking design but may not have fulfilled the brief specification. This is not to say that each designer did not follow the rules. All contestants must follow the strict guidelines (four wheels, convertible, number of doors, number of views, etc) or they are not allowed into the competition; the complaint is more subtle. Many contestants fulfill the guidelines but seem to take differing levels of care with the essence of the brief (relationship to a region, intent of the use of the vehicle, inspiration of the user type, etc). Unfortunately, when the design is very well executed from a technical rendering or sketching point of view, some feel that community members will vote a "5" even though the vehicle really might not meet the brief intent. Said simply, Good Sketches that are inappropriate are being thrown in with Poor Sketches that are totally appropriate and it is difficult to distinguish them with the current voting. Such voting for good technical skill alone was not the purpose of the voting system. Though the scale and the process was meant to create a fair and clear voting scheme, it is clear that we need to review it and assess the need for change. Along those lines, Local Motors is hosting a live chat tomorrow with anyone from the community who wants to join. Here are the details. Please join us if you want your voice to be heard or if you are simply interested in listening to others thoughts. We are looking forward to working on this issue. Anytime where the community becomes intensely engaged is a great time for our community and our team. Join us as we learn and grow together. If you haven't already seen or heard, Carbofos, a new member of the community, took home the Gold in the Detroit Competition with the entry entitled "Michigan". Close behind him were Maymay and Mihai. This was a powerful and challenging competition because it took on the standard notions of Detroit muscle-centric design and pushed to uncover a new language underneath the hard and wizened surface of modern Motown. The critique for Carbofos was not without spicy encouragement and negativity, but the debate raged, and that is what counts. Along the lines of engagement and debate, Local Motors engaged a new tool today that fundamentally changes the landscape of on-line design. Today we unveiled a fundamental functional addition to the Local Motors web interface - the ability to sketch using the majority of photoshop-like functionalities on any checkup, right from the browser. No need for your own software - we provide it. No need to download, open, work, save, reupload - it is all right in the browser. No need to post reworked images in the right place - this tool does all that for you. Now that we have launched this, you will be able to rework any checkup AND any visual comment within a checkup stream. Comment on designs, comment on people's comments, make them better, make them worse, make them different....the sky is the limit. Go ahead. Press the blue "Aviary" tool button beneath any checkup image and the magic begins. If you need some assistance the first time, make sure to click the "?" 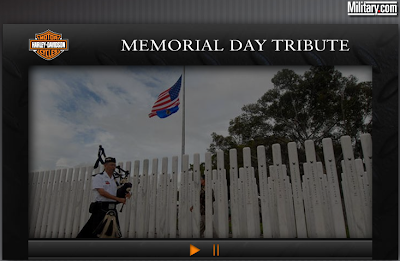 as we have offered a screencast to take you through the process the first time. When you are ready to brush up on your skills, the "Tutorial" button offers just such brushing up. Enjoy. Detroit has entered an exciting new era with an exciting "Michigan" car. And a new age of collaboration, sharing, critique, and improvement is upon us in the car industry. As expected, you have found it starting right here at LM. That's right Vision readers. We are ready to announce the next step in our unique automotive development process - Custom Car Skins®. 1) We have incorporated a process to build all of our cars with vinyl coverings allowing ultimate customizability at an affordable price with great quality and reliability. 2) With almost 2,800 bangin' contributors, the LM community has become robust enough to provide customers with a well-spring of great design ideas. With these two developments, we realized that there was a marriage waiting to be arranged. A Crowdsource marriage. 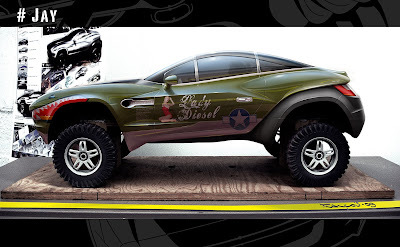 ...we have decided to develop this design functionality further in advance of the Rally Fighter launch. 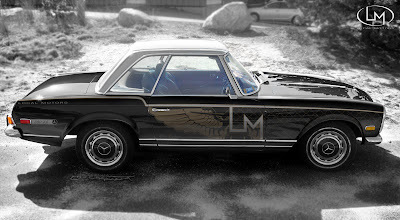 For this reason, we will soon launch our first Custom Car Skins® design competition where we will invite our community (and any graphically-inclined new members) to compete for the very first exterior design "skin" that we will execute... on none other than my very own 1971 280SL classic, Pagoda-Roof Mercedes Benz Roadster. As most of you know, Local Motors Competitions have, to-date, been "hosted" by our Company where LM will post a competition description and the community will submit, vote, comment and crown a winner. Perhaps the most fundamental shift in these Custom Car Skins® competitions is that the customer - NOT the Company - will post the competition description and pick a winner from the community. Of course, the community will still submit, vote, and comment, but increasingly more power will reside with the customer (the ultimate user)! Pretty cool shift for this type of comp. we think! So join us soon as I post the inaugural Custom Car Skins competition description calling for the redesign of the exterior of my car. The question is "What has happenned to all of the car startups in the last 20 years?" In short, this is a tough question, because many morphed, some have limped, and others have yet to meet any deciding point. It kind of depends what you want to hear. Anecdotally, there are many who have tried and "not succeeded" but really the number of failures is probably few especially in the past 20 years. Clearly the number of successes is also very very low. Perhaps Porsche is the greatest success from start to finish. Gordon Murray - Great Design. Not producing yet. I can probably think of more but this is a pretty comprehensive list of the most "well-known" startups (if you can call them that). 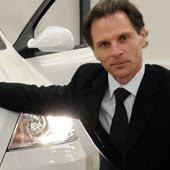 There are many others (Zenn, Twike, Universal Electric, Velozzi, MIT VDI, Wrightspeed, Trident Iceni, Gibbs (amphibious), Terrafugia (roadable aircraft)), but they have been mainly ideas that never made it beyond the garage or are not really pure cars. The array of names above is dizzying. With each: green is critical; design is a must; and cost is ever a focus. Almost without exception, however, each of these businesses above has banked on the car they make alone to carry the company to success, and they have accepted the traditional path to market (from company design to factory production to dealership with the customer only interacting tangentially at the end during the purchase). 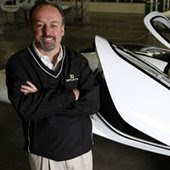 We, at Local Motors, feel that there is much to be gained in pricing power, trust, and improved product by bringing the customer in at each stage of the process. This is the difference of our design community, this is the difference of our micro-factories, this is the difference of going Local. Oh, and here are the results from yesterday's blog: It appears that Design wins and Data loses (at least in our small sample set). Isn't that interesting? Thanks Ari and Winston for the great comments. I agree with the additions that each of you made. Data vs. Design - Google vs. Apple - Where does LM stand? On May 9, in the PING column in the NYT, Miguel Helft wrote a column, "Data, Not Design, Is King in the Age of Google". An incisive report of the defecting of Google designer, Doug Bowman, from Google to Twitter - this article harshly exposes Bowman's bias against Google's method of trusting data above design in all decisions of product. 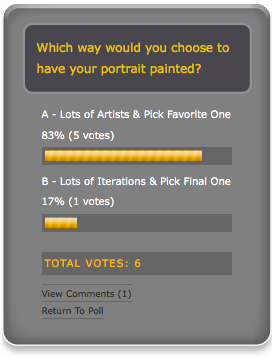 A) Hire many artists, each to paint their own version of you (independent of any feedback during the painting). Then show each to the crowd and buy their favorite. B) Hire one artist, have him paint the portrait, show it to the crowd, get feedback, repaint according to feedback, show it to the crowd, get more feedback, repaint according to additional feedback, show it to the crowd, get even more feedback, repaint according to even more feedback....and so on and so forth, and ..... buy the one when the feedback stops. In point of fact, there is probably no right answer, but rather this may be the essential chicken-and-egg of the modern design age. If you are one of the died-in-the-wool Page/Brin Googlers then your "right" answer is clearly "B", yet if you are a Jobs-ian Apple-a-holic then your "right"answer is most definitely "A". Again, globally, there is probably not one right answer if you consider profit any judge. Many Companies (these two chiefly among them) have made huge success on either side of the coin. I merely want to take the time to say that Local Motors has built itself to land on the side of "A". Every Day we talk about design and improve upon what we have, but at the most basic level, we respect an individual vision. Early on, people chided us for pursing a Homer Simpson car (a reference to a Simpson's episode where Homer puts all of the individual items that he would like cobbled together on a car in order to make the "perfect" car only to find out that he creates Frankenstein). Again, simplistic, but the analogy made us think at Local Motors and we chose. In our world, a singular designer choses the theme, the placement, and the design language for each of the vehicles we build, and within the realm of buildability, affordability, and safety, we build that vision. Sure, we consult the crowd when there is a decision to be made, but we employ an artistic vision to develop independent concepts before we profer those choices. When the dust settles and the road has cleared, Local Motors wants to be there standing with a remarkable statement of design vision, not an incremental improvement on the status quo. Hope this clears up any questions you might have about LM and perhaps makes you think about how you approach design in your own life. A new thing has happened in the Local Motors Glossary overnight. 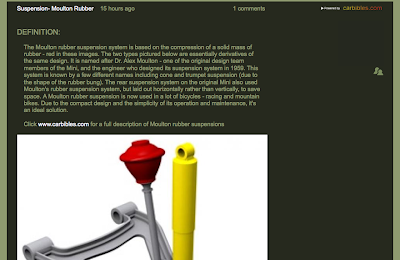 While the world was asleep, the newest member of our Engineering Team, Alex Leopold, has been feverishly updating the glossary to include a trove of information about automotive suspension. A seemingly insignificant upload in the world of information, but on a site like Local Motors, this sharing of easily digestible information is a hallmark of what we do. Our goal in life (and in business) is to make it friendly to learn stuff about cars. Many of us want to know more about the subject, but for many reasons (mean teachers, complex diagrams, lengthy descriptions) have not been able to scratch that itch. Now with the work that Alex has done, Local Motors is beginning to make this learning possible. None of this would be possible without the passion and the dedication of Chris Longhorst. Chris is a autophile and a great teacher. Over the years he has created a trove of information on CarBibles.com and it has grown and grown. When we found it, even our core engineering folks were blown away with the detail. So with Chris's permission we are providing snippits on the Local Motors site. For the full monty and much more of Chris' work, we also provide a simple link to head to CarBibles directly. 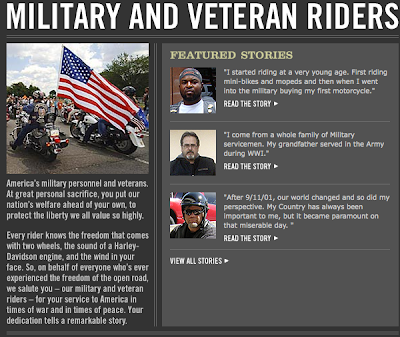 And make sure to send Chris a note (chris2009@carbibles.com) telling him you found him right here on Local Motors. He deserves it. Watch this blog for more engineering updates, coming soon, courtesy of Local Motors. Bring your entrepreneur hat and take a visit to these concepts designed for the Local Motors Detroit Competition. Born from the inspiration that these dual-use (fun and work) vehicles can be appreciated even in a down economy in a city such as Detroit, the entries to the Detroit Local Motors competition are a full palette of wildly divergent ideas. Over the next couple of days, I encourage you to explore the competitions tab on the website and to look over any one or all of the 63 entries. The winner will be announced after May12th. Come and play a forward thinking role in design of American icons of the road. Tonight, I was lucky enough to be part of a great panel on crowdsourcing hosted by BU Entrepreneurs and UltraLightStartups. Eric and Alex (respectively) did a phenomenal job bringing a 150+person crowd to the BU management center to attend the event, and we covered the gamut. Each brought a definite different flavor, but one thing was clear. Crowdsourcing is in full swing and best-practices are being developed to exploit opportunity at almost every turn. Know you crowd and know your customer. Remember that the crowd is a stakeholder as much as you client. Pay cash or Pay in street cred, but pay the ones who care and especially those who care and are good. Community is WAY more than an internet group. It is all around us. I am still reeling from all the learning, but all that I have already internalized is already going into action tomorrow. I feel on the cusp of a revolution even after 2 years. As proud parents of a Great Dane, there were many times in our dog traveling life that we could have used some serious forethought from car designers. Yes, we had a truck and yes we had a Minivan, and yes we had a Honda Element, but each of those three vehicles offered pet solutions as only an after thought. No restraint for the pet in the case of accident. No easy way to clean for hair and mud. No sure fire cool method when the car is off. No shade to block out passing dogs who choose to start a bark-fest. No water-bowl solution. No Bubble side window or roll down rear for the dog to be able to look forward while driving. No easy-in ramp solution. No way to contain when opening the rear gate or door when the hatch lifts up toward you and the dog sneaks out underneath. No fitted (but removable pillow) that makes sleeping comfortable for the dog on long trips. Basically a lot of missing items. 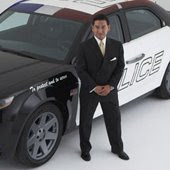 The other day I was thinking about hard-hitting Local Motors solution points for under-served customers, and how other companies can only really offer after-market gimmicks whereas we have the ability to deliver an integral solution that specifically addresses targeted needs. I got on Twitter and asked if there was any such car for dogs (which is only one such niche need) and 4 people responded directly that indeed there was just such a car concept. The Honda Element for dog lovers. Not necessarily as good a job as LM could achieve, IMHO, but for an OEM, I found this response, convincing. Wish they had had this when we bought our element, I bet our Great Dane wishes so too. Here's to other concepts that we could execute on strongly and leave Honda realing from the manufacturing complexity of fitting such niches into the mass. ...the list goes on. When you love one of these life-pursuits, we bet that we could make offerings that appeal deeply to your love. Check back in the future as we pursue these avenues, and let us know what you might like to see. 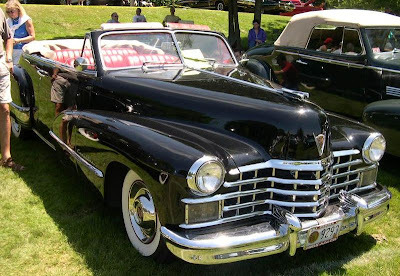 Two nights ago, my Father was walking down the street and snapped a pic of a resplendent 1946/7 Convertible Cadillac that was parked on the street where my parents live. This V8 powered, Harley Earl masterpiece is worth photographing by itself, but what made this particular vehicle type special to my father is that he remembered it as the car model his father bought his mother when she had her fourth and final baby boy, my Uncle Bill. Dad remembered this so strongly as the oldest brother, that he snapped this pic 62 years after the event and sent it off to all his younger brothers by email retelling the story of the gift as if it happened last week. I wonder, 62 years from now, would anyone take a picture of an iphone spotted "in the wild" and send it around as the thing that reminded that person of the "happiest days"....maybe, but something about cars lends that extra special characteristic of nostalgia. Someday Local Motors will be adored in that pantheon of happily remembered classics. In the meantime, let's enjoy the driving.